fuel for thought: Congratulations to Fred Zweep for his NGV Global 2012 Champion Award! 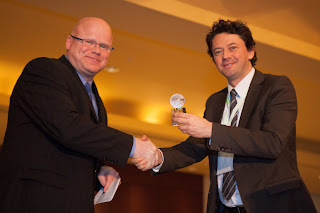 Congratulations to Fred Zweep for his NGV Global 2012 Champion Award! NGV Global 2012 is happening in Mexico City from November 7-10, 2012 and to launch the event, organizers recognized five outstanding individuals from around the world for their contribution to the natural gas vehicle (NGV) industry. Fred Zweep of Vedder Transport Ltd is an extraordinary ambassador and Westport Innovations is proud to congratulate him as a 2012 NGV Global Champion. Fred is an astute and well-spoken business man with a relentless commitment to his community, clients, partners and employees. His work and business ethics are second-to-none and his continuous support to the NGV industry is admirable. Fred Zweep receiving the award for NGV Global Champion from NGV Global Chairman Gabriele Gozzi. Fred’s dedication to both operational and environmental excellence, combined with his passion and integrity, has led the company to adopt a multitude of innovative solutions. In December 2010, Vedder Transport was the first operation of its kind in Westport Canada to announce its purchase of 50 Peterbilt liquified natural gas (LNG) trucks powered by Westport HD systems. Fred’s constant commitment to achieving excellence and safety has also positively influenced the perception of LNG trucks. Furthermore, his innovative leadership has become known around the globe, and Fred regularly welcomes industry stakeholders, government officials and commercial fleets to his facilities in British Columbia to showcase his successful adoption of LNG trucks. These visits and meetings are arguably the most effective activity to demonstrate the tangible benefits of NGVs and convince additional fleets of the advantages of adopting LNG trucks, consequently encouraging the use of NGVs in other jurisdictions. This 2012 NGV Champion award recognizes Fred’s exceptional contribution and valuable support to the NGV industry at home and abroad.